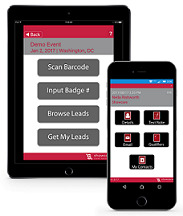 Showlead Mobile is the latest and most feature-rich of smartphone data collection apps available for exhibitors at trade shows. By utilizing the power of an iOS or Android device, exhibitors can manage sales leads more efficiently and less expensively than ever before. With a simple scan of the QR Code or manual input of the badge ID using a smartphone or tablet camera, exhibitors gain immediate access to the complete contact record including crucial demographic details. **Devices require 'back facing' camera. Low-cost with real-time lead data synchronization and securely stored on showlead.com. Scan of the QR Code or input the badge ID for immediate access to lead details using a smartphone or tablet camera. Complete with 10 standard sales qualifiers, ability to add notes, email, follow-up and store contacts within seconds. Application can be used anywhere – both on and off the show floor. Lead data access is available online at any time. Requires internet connectivity to sync data. Note: Smartphones/tablets are not provided. Custom Sales Qualifiers not available for the Showlead Mobile. Use your own PC, automatically assign reps to leads. 1 License per computer application is required. 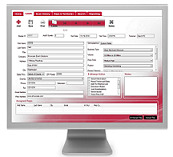 Showlead Desktop Software Application includes regional sales rep reporting and tracking functionality. The software application operates on the exhibiting company's computer and requires the use of either the Symbol DS6608 or DS6708 tethered barcode scanner or the Honeywell 1452g Wireless Barcode Scanner which are available for rent from Showcare Event Solutions. Exhibitor must have their own computer with available USB port. Latest Microsoft operating systems (supported by Microsoft) with the latest servicepack, security updates and minimum .net 3.5. Minimum 2 GB of available hard disk space. Minimum of 4 GB of RAM + 1 available USB port. Session cookies: When a user starts browsing the web site, the web server sends the user a cookie containing a unique session identifier. The server uses this cookie to track who the user is, where the user is within the application and what information the user is interacting with. Session cookies also help to improve page load times, since the amount of information in a session cookie is small and requires little bandwidth. Session cookies are not kept after a user closes the browser. Still have questions or looking for technical support?